The wide ranging experiences of someone who lives in the Australian bush in a knocked together tin shed with a heap of animals and still manages to hold down a job, study full time and raise a family. 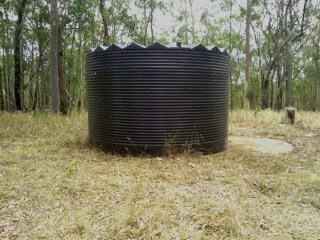 It hasn't rained for a while here and the big (22000 litre) header tank is empty. 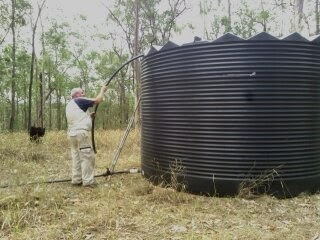 We still have two 4000 litre tanks full, but things are getting desperate. A lot of our neighbors are already buying water, so I consider us lucky to still have as much as we do. The header tank being empty means we have had to go back to bringing all water into the humpy in a bucket; bath water (3 buckets a day), washing up water (1 bucket a day),clothes washing water (12 buckets a week) and then carry them out again to put onto the garden. I had forgotten how convenient it is to have a tap in the house. My partner has been avoiding putting the new header tank in for some time, but a week of carrying his own water in and out of the house convinced him to take action. 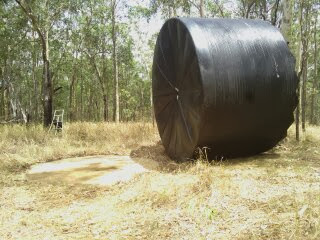 The green tank is the old header tank (22000 litres) and the black one is the new tank (27000 litres). The first order of business was to move the old tank out of the way. We tied a strap around the top of it (after all the pipes were disconnected) and pulled it over with the car. 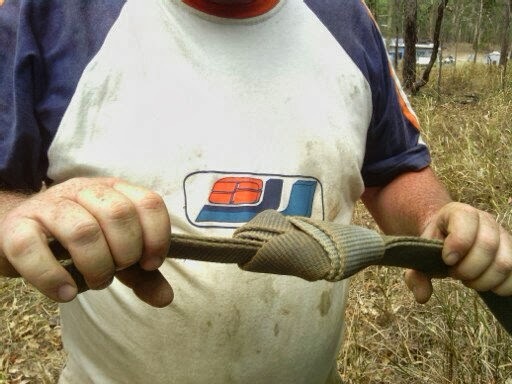 The figure of eight knot my partner used to be sure we could get the strapping untied again after the job. 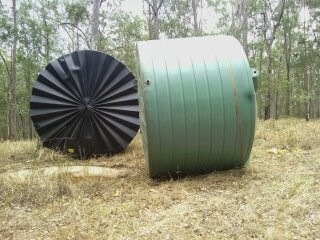 The tank tipped over and ready to be rolled away to it's new home. 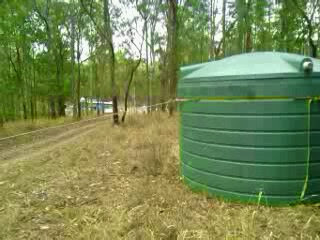 After much maneuvering we managed to get the new tank into position; now to tip it over onto it's base. 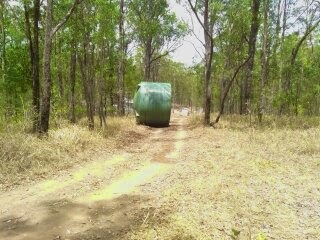 The old tank rolling away towards the humpy (causing much ado with attendant swearing, running and flapping of hands). We stopped it with a conveniently placed tree. The second attempt at flipping the tank over onto it's base. There were many more. Eventually I had to drive the car while my partner levered the thing upright with brute strength (which I greatly admired). 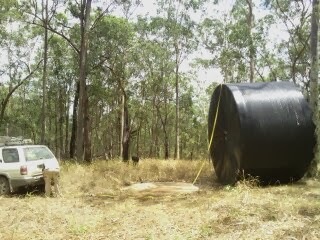 The tank was then towed, via a rope around the base, back to the tank pad of sand the old one had been sitting on. 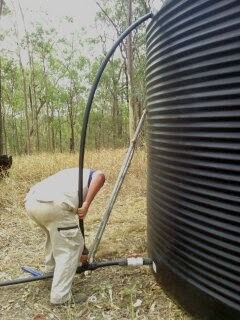 My handy partner then attached all the attendant pipes and we were ready to pump up the 4000 litres from the house tanks. 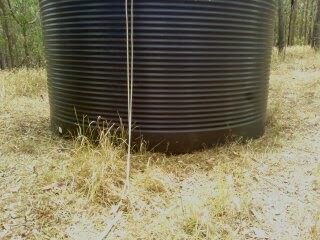 We have water in the header tank again. 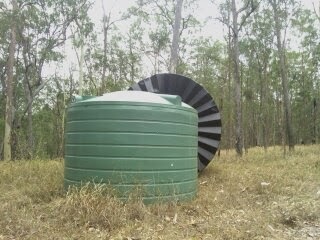 It should last us another month (at the rate of 1000 litres per week). A storm is threatening as I type, but as yet there is no rain. 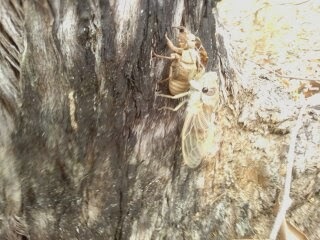 While we were fiddling around with the tank I had the opportunity to watch cicadas metamorphosis from an underground dwelling beetle-like being into a flying insect. I got photos in between exciting tank chases and tank tipping exercises. 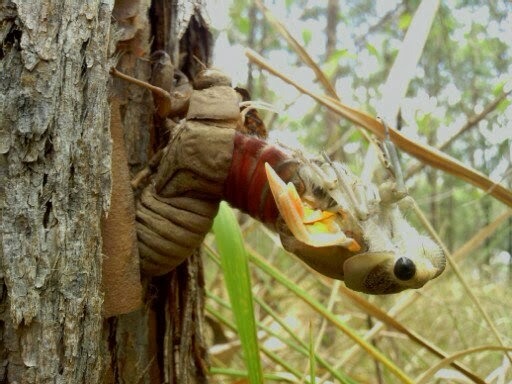 At this point she was just emerging, wet and raw from the shell of her old body. 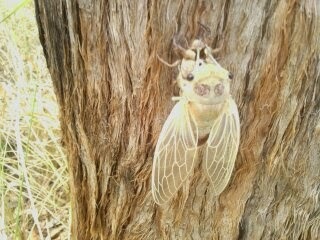 Another one, fully emerged and waiting to dry. They will be noisy in the bush by December; thousands of cicadas calling for a mate, hundreds of birds feeding young off the bounty of a cicada hatching and one or two hawks, goannas and kookaburras feeding off the baby birds. 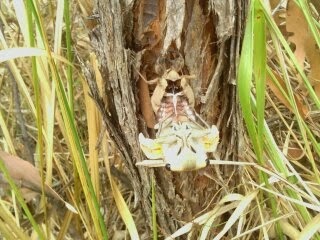 What a rich ecosystem we live in, even when it's dry. Is it dry in your area? How do you cope with the shortage of water? Hi Lynn, thanks for commenting. We are moving slowly towards a self sufficient home (maybe we won't get there, but that's where we are aiming.